There was a time when one might have admired the country’s Grand Old Party (GOP). It was the party of the Grand Old Man (GOM) who put Sri Lanka on the free world’s map as well as earned us a black mark against our name for national crimes committed in the face of pragmatic politics. Be that as it may, there was much to endorse in its ostensible ethos back in the day, if one did not examine its modus operandi too minutely. Then, as now, it wasn’t good for one’s stomach to know how laws and sausages were made. And how successful parties united national interests with partisan agendas to fund political campaigns. To do so today, to endorse the UNP’s sea-green incorruptible self-image, or take it a step farther and become a card-carrying member or an MP in its stalwart ranks, is tantamount to committing political hara-kiri. 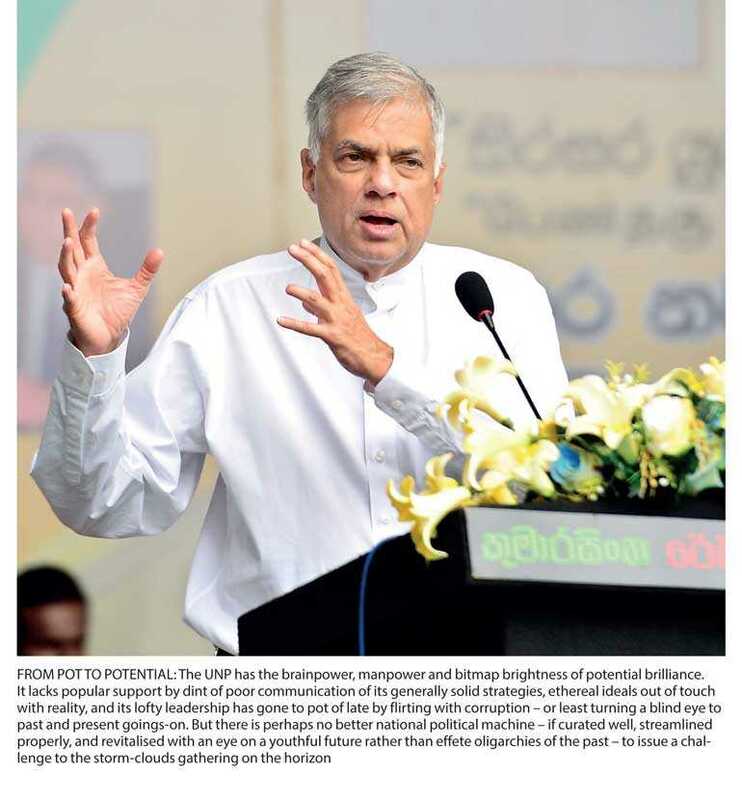 A golden opportunity at national transformation presented on a platter to a UNP-led government by an autocrat greedy to consolidate power – squandered by an oligarchy of old-boy network obscurantists? To be fair, they had more than a little assistance getting hamstrung from their helpful but not every bright young supporters’ club… to say nothing of a bright but not very helpful or in the least beautiful Joint Opposition (JO). A rather helpful classification of the parties concerned, at least to the readership of this newspaper, might be the Good, Bad, Ugly (GBU) schema. In its simplest form – back in the day, but not too long ago to be out of mind – the GOP was good. The yokel who would make a good common candidate was bad but could be used for the common good. And an idealistic common front could be well employed to keep the ugly yobbo and his cohorts from hell at bay – in everyone’s best interests but the gobs’, of course! In due course, the formula underwent some modification. The GOP presented the yokel as the middle classes’ all-new GOM of sorts atop a supposedly ‘new’ political culture, which was good. The JO yobbos et al. put spokes in the wheel of progress at every point, which was bad news for the reforms agenda. And the plug-uglies were relegated more or less to outer darkness, which was beautiful – because it gave us all a breather and democratic-republicanism a decent chance to refresh itself. If I appear to paint a bleak picture, it’s because the apocalypse is upon us. Apocalypse in the original Greek sense of the word… a revelation: an uncovering: the truth behind the façade when the mask slips or is ripped off. No one loves the smell of napalm in the morning; but since good governance is bombing itself into oblivion, it’s incumbent on the fourth estate’s commando regiment to pick up the pieces. Today, the new ugly is that the Managed Spectacle (MS) of all being cosy in a marriage of political convenience is not only over, it is all over the scandal sheets – as if papa-bear and mama-bear have been exposed for child molesters who care precious little for Goldilocks but had only porridge on their mind all along. Today, the Monstrous Regimen (MR) that is, was, and will be again – if we don’t look sharp – is more than knocking on the door… it’s breathing down our neck… and more than the good, bad or ugly of it (for there is nothing either good or bad, but thinking makes it so), may I simply say God Bless U (GBU) – and leave it there! So, where do we go from here? Well, the not-quite general officers in the ugly corner seem to have a pretty good idea how bad the present lot are and how it is all their fault that the country has come to this pretty pass. In the strange case of these ex-officers and former senior officials under the previous strongman’s latterly oppressive regime, they seem to have some welcome help from the powers that be themselves. For those who rode in on a pale horse trailing pink ribbons and promising peace and justice have fallen short – to say nothing of incurring a laughable (if you’re a gob) or lamentable (for everyone else) fall off their high horse. There is no good or kind way to explain why the baddies are still at large, thumping their chests and rattling sabre to boot. In the short term, it’s no use pressing the National Unity Government to do anything meaningful to address the distressing realities of partisan and personal disunity at national levels of governance. That ship set sail the day a sitting head of state forgot he was meant to be a one-term prez and pressed the Supreme Court for an extension, thereby nailing his true colours to the mast. Nor is it any use nominating the Central Bank imbroglio – egregious as it was – as the beginning of the end; because governors before the last one has been in cahoots with crooked governments while our culpable baby was in diapers. In the medium term, it behoves the GOP to reverse its habitual MO of snatching defeat from the jaws of victory. One suspects that its incumbent GOM is not a man easily given to eating humble pie; but his mumbling dissembling apart (“he’s my friend, I appointed him; he’s not my friend, I’m disappointed”) he might be the best man for a bad job: rescuing the state from its present rottenness by breaking with turncoat chief executives; investing in streamlining the only national party with an internationalist worldview that will bode our interests well; prosecuting past villains – as promised – with no thought given to personal agendas or pragmatic wedges against the gobs at the gate. In the longer term, nothing less than genuinely reforming the GOP and bringing its GOM down to Earth from a lofty Olympus will serve the nation-state. But I’m not holding my breath in cloud-cuckoo-land. Since every effort at making a once admirable party has gone the way of all flesh – towards kitchen cabinets and comfort zones where skeletons in the closet are dismissed with mumbling dissembling. In the long run we are all dead – GOPs, gobs, yobbos, yokels and all.